The Queen Pegasus launched as a powerhouse, selling eyelash elixir kits to young women. Our Shopify theme provided a great solution that helped the business hit the ground running, engage quickly and achieve strong sales from the startup. Since 2010, we have built our understanding of Shopify and its capabilities, and we learn more with every project. Working with international brands that do business in the world’s biggest markets is exciting for us and lets us give high value to our Perth ecommerce clients. We won the opportunity to design and develop a custom Shopify solution for the new The Queen Pegasus ecommerce business. To give you an idea of this brand’s scale, the launch included influencer marketing by internet breaker, Kim Kardashian herself. Enough said. This project was for client Founded Ventures, the business behind Flat Tummy Tea / Flat Tummy Co and Sneaky Vaunt and we replicated our ecommerce learnings from those businesses to create a progressive and highly success new Shopify website for 'The Queen P'. 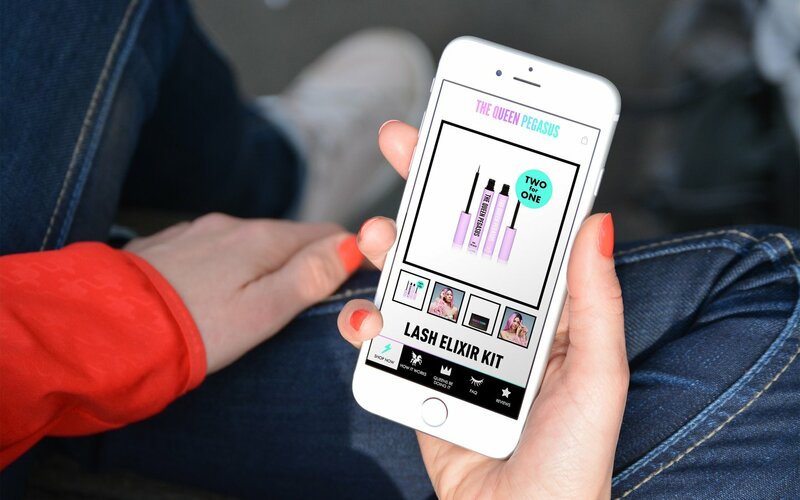 Founded on another simple and cutting edge product concept, eyelash elixir kits for young, beauty conscious women, this business had a swag of ambitious goals for a startup. With an ambitious client, a simple product offering, and a large market ready to tap into, this project gave our Shopify experts exactly the type of project where we can add maximum value and push the boundaries of what can be achieved with Shopify. A few of the specific challenges presented by The Queen Pegasus project for Founded Ventures included a new design for a new brand, new business and new products, enabling subscription management and payments using the Bold app, bespoke functionality requirements for recurring orders, plus the urgency of quickly achieving high quality outcomes for a fast moving young business. After collaboration and strategic work with the client team, the custom ecommerce solutions developed by our team of Shopify experts involved a structured review and feedback process with the client, custom ecommerce interface design, app research and investigation to find the Bold app, the integration of the app and required function customisation and implementing the recurring orders functionality. In short, the project was a success and the business launched seamlessly, with challenging features and timing goals met and strong sales and fast growth from the very beginning. We managed to create bespoke functionality to enable the recurring orders and subscription ordering via the customisation and integration of the Bold app. Plus, as you'll see if you take a look at the site, the Intuitive user experience is intuitive, simple and easy as it takes customers quickly to the pint of sale and increases conversion rates. Ecommerce is exciting and we deliver the best Shopify websites to optimise business success. Talk to our Shopify experts about building your ecommerce business.